When your feet are not transmitting your weight to the ground properly, this can cause problems higher up the body - in the knees, hips or lower back. 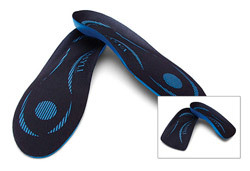 Orthotics can be placed in your footwear to correct these imbalances and reduce problems elsewhere. Suffer with walking pain and/or discomfort? A biomechanical assessment & basic gait analysis can determine whether made-to-measure foot orthotics would help improve posture, as well as reduce the pain associated with walking. Please ask to speak with one of our Osteopaths or Podiatrists for more information.